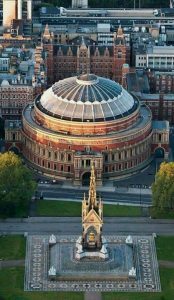 Below is the detailed description of the Royal Albert Hall which is a concert hall in the northern area of South Kensington in London. The hall has a capacity of more than 5000 seats. It was opened by Queen Victoria in 1871 and has been the stage of performance for the most brilliant artists ever since. 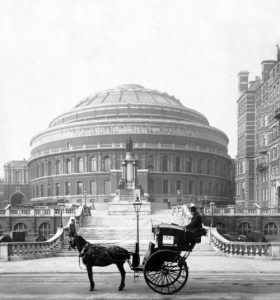 After the Great Exhibition of the Crystal Palace in the year 1851 which was led by Prince Albert Consort, he had the vision of building the Royal Music Hall, as the project was known then. The progress on this project was very slow and even almost turned down after the death of Prince Albert in 1861. However, Queen Victoria laid its foundation in May 1867 and signed a Royal Charter with Corporation of the Hall of the Arts and Sciences. The engineers for the hall were Captain Francis Fowke and Major General H D Scott who was two of the Royal Engineers present in the court and the construction contract was taken by the Lucas Brothers. The ceremonial opening of the hall was done officially on the 29th of March, 1871. The first performance in the hall was given on the ceremony itself. The system of lighting the hall happened through gaslit, thousands of gas jets were lit on the first day of the hall. This is how the lighting system functioned until 1888. 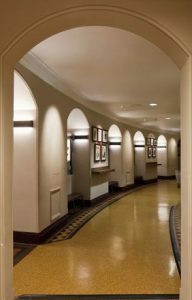 After that year the electric lighting system was installed. The hall is built in a dome pattern where the dome is made of glass and wrought iron. The dome is 135 feet high. The hall was designed with the aim to accommodate 8000 people but due to safety restrictions, the maximum capacity is listed to be approximately 5000. There is an amphi corridor situated on the ground floor of which there are fluted aluminum roof and diffuser disks. The flooring is wooden and the type of wood is hard and strong. The first concert ever performed was by Arthur Sullivan on 1st of May 1871. The first Miss World Contest was staged on the Royal Albert Hall in 1969. In the same year in the month of June, a Pink Floyd Concert was held in the hall. The British Gothic Rock Band called the ‘Sisters of Mercy’ also performed in the hall in June 1985. Many National Television Awards have been hosted in the hall by Sir Trevor McDonald, a British journalist. There have been innumerable such events taken place at the hall since 1871. 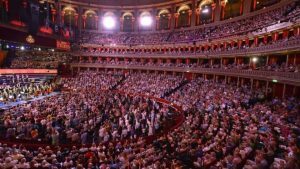 Regular events like the Royal Choral Society’s musical delivery on the day of Good Friday every year have been taking place to date since the year 1872. 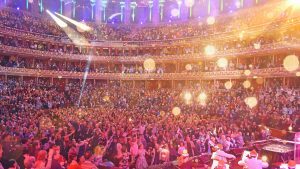 The most popular event of the BBC Prom takes place every year during summer for 8 weeks in the hall. The 8 weeks are filled with classical music nights, concerts, dances, performances, etc. The ATP Champions Tour Masters play tennis every year in December since the year 1997. It was first played in March 1970. 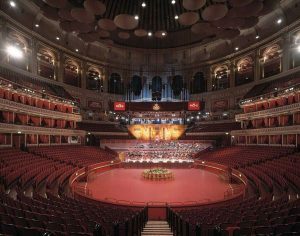 The Classic Brit Awards, the Classical Spectacular, the Royal British Legion Festival and many other such events are celebrated at the Royal Albert Hall. The English National Ballet has been taking place in the hall since the year 2000. Many charity events like the Teenage Cancer Trust holds a concert annually to raise funds for curing teenage cancer among youngsters. Movie premieres, live orchestra, and other screening events take place in the hall. There are five senior authorities that govern the hall activities – the Chief Operating and Financial Officer, Director of Operations, Director of Business Development, Director of Events and the Director of External Affairs. The CEO of the hall is Mr. Craig Hasall. The Council of the Corporation is the main trustee body of a charity. The council consists of a President and 18 elected members.